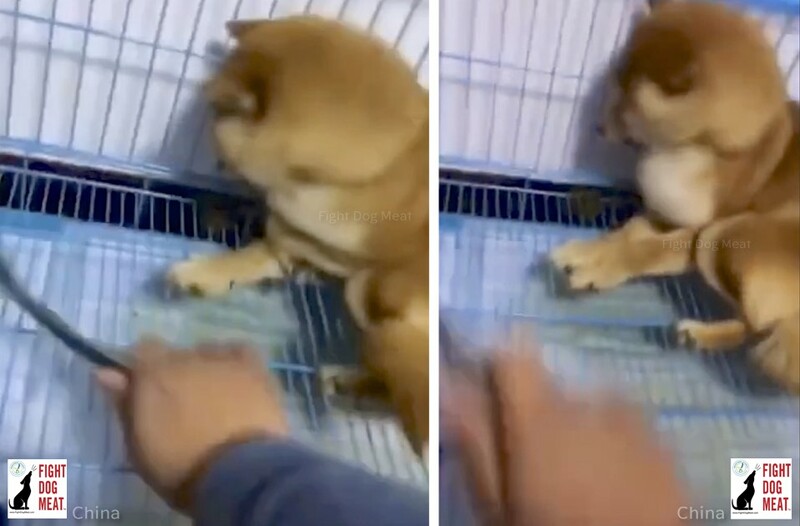 Dr. Chen Yulong beat his terrified Shiba Inu dog, then slowly poured boiling water over the dog’s back as it screamed in agony in the tiny cage. The dog’s name is Strawberry. This medical doctor works in a burns unit at the Nantong Affiliated Hospital in Jiangsu Province. Dr. Chen Yulong had two dogs. He systematically starved his other Shiba Inu dog to death! As a medical graduate working in a burns unit, Dr. Chen Yulong knew exactly how much excruciating agony he was inflicting on Strawberry, while she was trapped in the tiny cage. 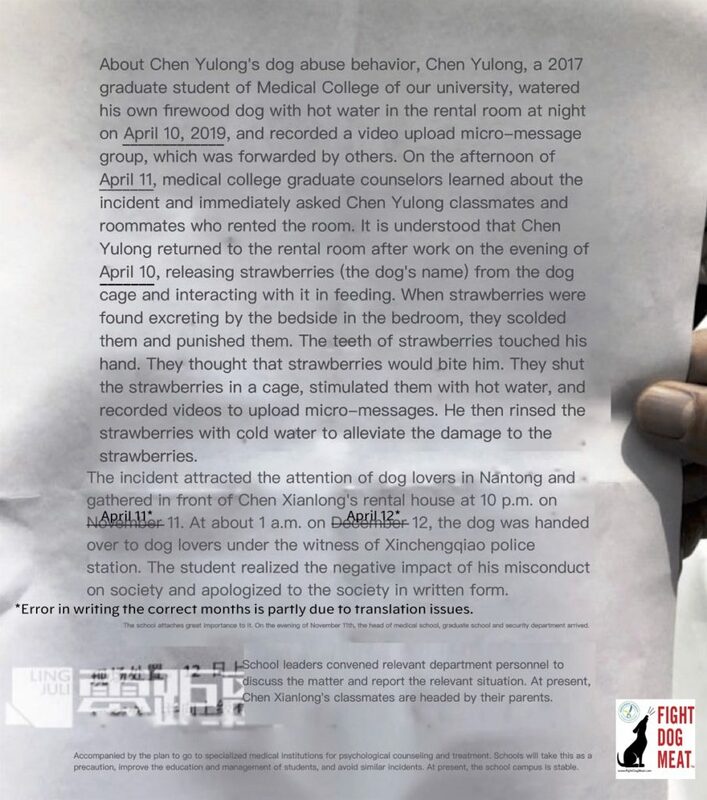 Dr. Chen Yulong justified his actions because Strawberry had relieved herself in the room, while she was locked in the room all day. The doctor said as he was beating her, her teeth brushed his hand; probably when she was screaming in terror. So to further punish her he poured boiling water all over her back. Remember: this is an educated doctor who works in a burns unit of a hospital! Video: graphic warning. Viewer discretion advised. Dr. Chen Yulong videoed himself torturing his dog and posted his own videos on his Chinese social media account. Volunteers located his apartment and banged on his door at 1am in the morning. He was not inside the apartment. Local police removed the dog from the man’s apartment and she was handed over to local animal rescuers. Strawberry is now receiving medical treatment for burns and trauma. Medical student and dog torturer Chen Yulong. When the backlash of Dr. Chen Yulong’s disgusting behavior was shared all over Chinese media, the hospital released a pathetic apology on his behalf where they justified his behavior. 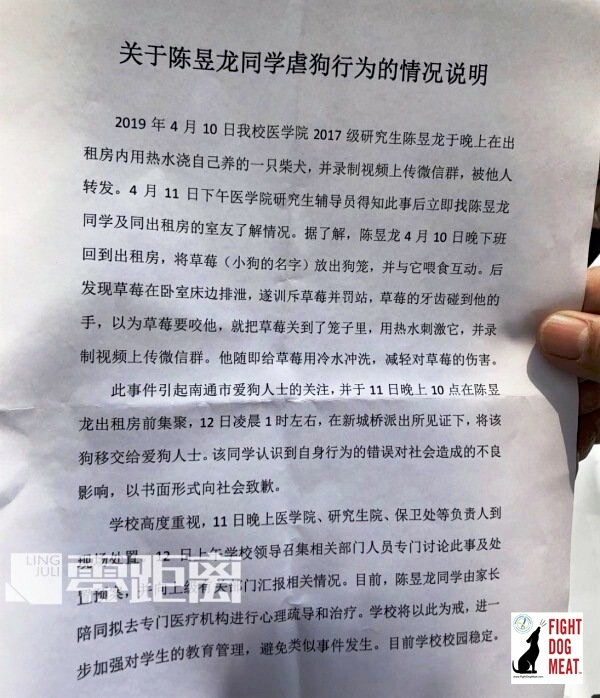 Dog torturer and medical student Chen Yulong’s apology, issued by the hospital. Dog torturer and medical student Chen Yulong’s apology, from the hospital. 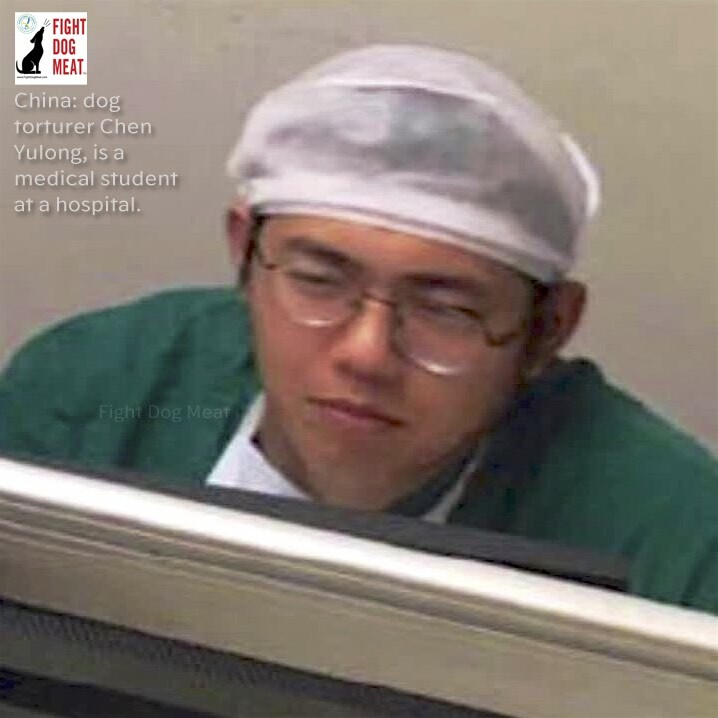 Its particularly disturbing to see the hospital support Dr. Chen Yulong when he deliberately inflicted burns on the animal, knowing the full effect of the outcome ahead of his actions. At the very least the doctor should have been immediately stood down pending an investigation. Many countries would have arrested the doctor for animal cruelty charges. The World Dog Show is being held in Shanghai later this month, with international judges. What a shame the international dog judges refuse to see the depth of cruelty being inflicted everyday upon animals in China. They accuse organizations such as Fight Dog Meat, of ‘making mountains out of molehills‘ in exposing cruelty in China. 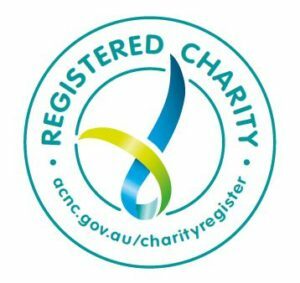 We will continue to create awareness for animals in critical need until animal protection laws are implemented and enforced.